FrostWire is a peer-to-peer file sharing program for the Gnutella and BitTorrent protocols. FrostWire for Android is written in Java, and is a fork of LimeWire, another popular Gnutella client. Released under the GNU General Public License, FrostWire for Android is free software. FrostWire includes much of the functionality of LimeWire's free version, as well as a few of LimeWire Pro's payment based upgrades. FrostWire provides a chatroom. ...... Pro's payment based upgrades. 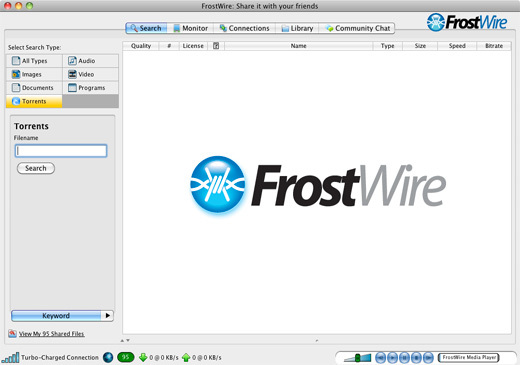 FrostWire for Android provides a chatroom, which is absent in LimeWire. *100% Peer to Peer, you're the cloud. *Share files locally or over the Internet with Wi-Fi. *Browse shared files by other Androids. *Search files in the entire network in seconds. *Chat and Send private messages.Send files. *These can be your files or files shared by others, sharing is collaborative and social. *Convenient controls to share/unshare files in bulk or file by file. *Available on all Android versions, no need for 2.2. *Compatible with Android devices running 1.6+No Ads. Is an updated, improved remake of the classic arcade game Arkanoid. Convert music, videos and photos for your Android-device! Is an automatic Hold'em playing pokerbot add on for Online Holdem Inspector. Qweas is providing links to FrostWire for Android 5.3.7 as a courtesy, and makes no representations regarding FrostWire for Android or any other applications or any information related thereto. Any questions, complaints or claims regarding this application FrostWire for Android 5.3.7 must be directed to the appropriate software vendor. You may click the publisher link of FrostWire for Android on the top of this page to get more details about the vendor.